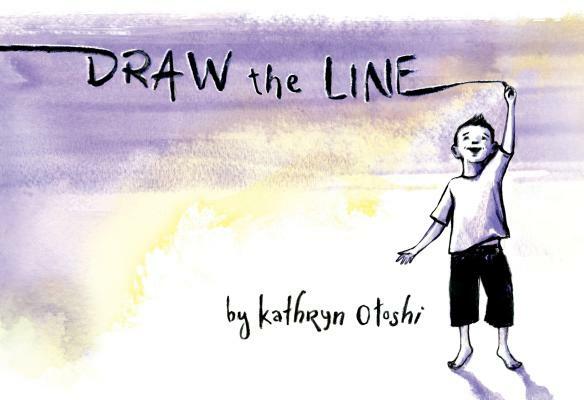 Draw the Line is a powerful picture book about forgiveness from Kathryn Otoshi, author of the bestselling book One. When two boys draw their own lines and realize they can connect them together—magic happens! But a misstep causes their lines to get crossed. Soon their line unravels into an angry tug-of-war. With a growing rift between them, will the boys ever find a way to come together again? Acclaimed author/illustrator Kathryn Otoshi uses black and white illustrations with thoughtful splashes of color to create a powerful, multi-layered statement about friendship, boundaries, and healing after conflict. Kathryn Otoshi is an award-winning author/illustrator, best known for her character-building number/color book series: One, Zero, and Two. She is also the co-author of Beautiful Hands, a book about possibilities and reaching your dreams. She travels across the country to encourage children to develop strong character traits and to help readers find creative methods to engage and connect with their students through the power of reading, art, and literature. She lives in the San Francisco Bay Area.